The palace of the former Domescadian Emperor Abdel Adham. He reigned a bloody rule during the years 2261-2282, and had instigated the attack on the Beijio and Scardian people which became one of the greatest battles of all time during the year 2282. Although his reign ended shortly after 2282 due to his body being sealed into the demon realm, the Emperor was feared as well as respected by his subjects as a ruthless land hungry tyrant. Now it is simply a forgotten and tossed aside ruin. Though even in it's ruined state, it is still an imposing sight to behold. 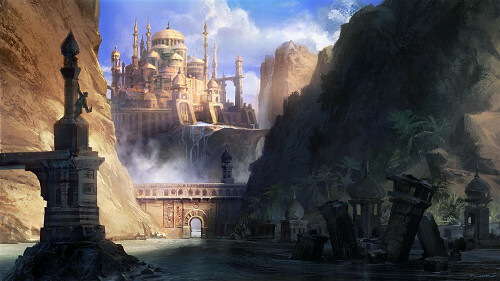 A palace made of several kinds of Alabaster, situated inside a sealed mountain cave. It once belonged to a great and powerful Empress, but has since been lost to the sands of time. The Mountain stands midst the desert, and is unique for it stands out like a fin amid an endless ocean of sand. A lil'spot o' paradise in the land of the beating sun!